SEO For WordPress is an in-depth ultimate Guide For Beginner bloggers and WordPress users to learn How To Make WordPress Site SEO Friendly to increase blog traffic. A Step by Step guide for beginners to learn basic and advanced SEO for WordPress Website for better Search Engine rankings. Starting a blog is simple and easy but it is hard to run a successful blog, writing great content and driving traffic to your blog is not very simple and easy. We have published a step by step guide that explains How to create a blog using WordPress?. If you really want to grow your business, start your blog today. In this in-depth SEO For WordPress guide, I am going to share how to make WordPress site SEO friendly from the start. how to use images to make WordPress site SEO friendly and much more. A 2014 BrightEdge.com study finds that 51% of all visitors come from organic search (Google, Bing, Yahoo etc), dwarfing traffic from other channels including paid search (10%) and social media (5%). Mostly, Search Engines are the primary driver of traffic to your business or personal website. With better Search Engine Optimization you can drive quality and highly targeted traffic to your blog or website. Search Engine Optimization or most commonly known term SEO is the technique to optimize your websites for Search Engines (Google, Bing etc). Let’s start learning how to make WordPress site SEO friendly. Let’s learn how to make WordPress site SEO friendly?. I am going to outline some best practices that can help you to make your WordPress websites more search engine friendly. For some basic settings you don’t need any plugin but to optimize your content (article, pages, and videos) you should use WordPress SEO plugins. There are many free and best WordPress SEO Plugins available. Yoast SEO and All in One SEO are two very popular free plugins to make WordPress site SEO friendly. WordPress is now powering almost 25% of the web, and thousands of new websites are created every day. It is really important to drive traffic when you start a new blog or website. WordPress itself is a very search engine friendly Content Management System. But with better planning and using some best practices you can improve your search engine rankings. Better Search engine rankings mean more traffic, more subscribers, more customers and more profit. Do you need WordPress SEO plugins to make WordPress site SEO friendly? It is not necessary to install a plugin but with WordPress SEO plugins it is very easy to optimize your content and make your site SEO friendly. I personally use Yoast SEO plugin to optimize WordPress for search engines. Yoast SEO is most popular free WordPress SEO plugin. If you are using any other WordPress SEO plugins, that’s not a big issue. Almost all WordPress SEO plugins offer necessary features to optimize Different (30+) type of WordPress websites. Google is the most popular search engine and almost all web developers and bloggers want higher ranking in Google. Here are some key points to remember when optimizing your websites for search engines. These guidelines are for all types of websites. it does not matter if you are using WordPress or any other CMS like Joomla, Drupal etc. You should always follow these guidelines to make your website SEO friendly. Google recommends the following Best Practices to get higher search engine rankings. Make a website with a clear hierarchy and text links. Every page should be reachable from at least one static text link. Make sure that your title elements for links and ALT attribute for images are descriptive and accurate. Create mobile-friendly fully responsive websites, Google recommends responsive web design and discourage different websites for mobiles. Mukesh has written an in-depth Beginner’s Guide to Properly Using Rel Tags To Improve Your Site’s Rankings, In this guide, You will learn how to properly use rel=”canonical”, Rel next/prev tag rel=”next” and rel=”prev” and Rel alternate tag rel=”alternate”. First of all, I am going to discuss some basic Best WordPress SEO practices, you don’t need any plugin to follow some of the best practices outlined here but we recommend Yoast SEO plugin. First thing first, make sure search engines can index your website. Under Settings, > Reading Uncheck Discourage search engines from indexing this site. One of the most important thing that can help you to optimize your blog for search engines is the choice of domain name. We have published a step by step guide, read How To Choose A Good Domain Name For Your Blog to learn more about domain name best practices. Page Load Time matters: choose a good hosting provider, install caching plugin to make your WordPress website load faster. Visitors tend to abandon a site that isn’t loaded within 3 seconds. Speed is very important for search engines such as Google hates slow website and users will leave your website if it will take too much time to load. Choose a good WordPress web hosting service provider. Make sure your website is fast enough. Start with a good hosting provider. Reducing the page loading time of your website pages improves your visitor’s user experience and reduces the chance of them hitting the back button on their browser. After installing WordPress install a WordPress caching plugin. For example, W3 Total Cache is a very popular free plugin to optimize WordPress for speed. There are a number of ways in which you can improve the speed of a WordPress website, however, a WordPress caching plugin will make the biggest difference. Here are few popular free WordPress caching plugins. For more details about caching plugins and caching process read this Five Best WordPress Caching Plugins post. If you are publishing new content on regular basis and use a lot of images, and videos in your posts, must install Lazy loading plugin to improve the performance of your website. Google recommend web developers to add both www and non-www version of their websites to Google Search Console (Google Web Master Tools). You should not ignore this. Login to Google Search console and add both versions of your website. Then select the preferred version of your website. The preferred domain is the one that you would like to be used to index your site’s pages (sometimes this is referred to as the canonical domain). Links may point to your site using both the www and non-www versions of the URL (for instance, http://www.example.com and http://example.com). To learn more how to set Set your preferred domain (www or non-www) visit google web master guidelines. Make your permalink structure search engine and human-friendly. 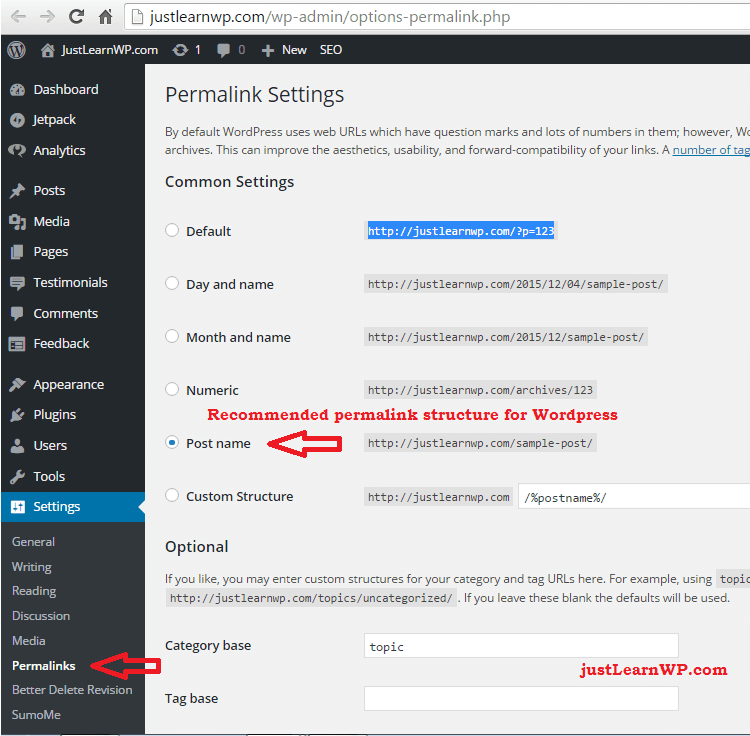 WordPress helps you to easily change the permalink structure. You can see the permalink settings under Settings > Permalinks. According to Google webmaster guidelines, a website’s URL structure should be as simple as possible. Always consider organizing your content so that all URLs are constructed logically and in a manner that is most intelligible to humans (when possible, readable words rather than long ID numbers). For example, YouTube video URL’s are not appealing and human readable. See example links below and decide which one is better. will help you decide whether to click that link. Now you understand How To Make WordPress Site Seo Friendly with a better permalink structure. Google recommends developers to use punctuation in your URLs. according to Google http://www.example.com/green-dress.html is much more useful to us than http://www.example.com/greendress.html. Google recommends use of hyphens (-) instead of underscores (_) in URLs. How To Make WordPress Site Seo Friendly with better content. Always Write Original Content: Google and other search engines hate duplicate content. Always avoid duplicate content. You can read more about duplicate content at Yoast blog. If your blog is a one author blog, or you don’t think you need author archives, use WordPress SEO to disable the author archives. Also, if you don’t think you need a date based archive: disable it as we have. Use related keywords within blog post but don’t add too many keywords. The lengthy in-depth article works much better than short articles. Your blog post must contain more than the 300 word recommended minimum. Many bloggers prefer to publish longer blog posts (1500 – 3000+ words), according to them longer blog posts works much better than short articles. It depends on what type of content you are publishing on your blog. If you can cover your topic in 600 words don’t try to make your post lengthy. Never ever sacrifice good writing for SEO. The best pages are written for the readers, not for the search engines. Don’t forget to use bold, italics, headings, and other emphasis tags to highlight keyword phrases, but don’t overdo it. Another important thing is content readability. Use ordered and unordered lists, tables where necessary. This indirectly improves your SEO. How does it help? because if your content is great and people can read your content easily, some of them will share your content on social media, many users will link to your blog post as well. Backlinks can not only help you to improve SEO but your blog traffic also increases. If people can not read your content easily on desktops and mobile, they are not going to share your content. Neither they will sign up for your email list nor they will come back to your blog. Google has published in depth Content guidelines that helps you to create great content for your blog or websites. The description attribute within the tag is a good way to provide a concise, human-readable summary of each page’s content. Google will sometimes use the meta description of a page in search results snippets, if we think it gives users a more accurate description than would be possible purely from the on-page content. The Meta description is the black piece of text shown beneath the URL in search results and any words that match the search term are bolded in the description. Meta description describes your page to search engines. According to WordStream Blog, while the perceived (and real) importance of metadata has depreciated, the attribute still plays a significant role in SEO rankings. Read: How To Write Effective Meta Description in WordPress to Persuade The Searcher To Click On Your Link. According to Yoast blog, The meta description is usually only used when it contains the keyword the searcher was searching for. Meta descriptions are commonly used on search engine result pages (SERPs) to display preview snippets for a given page. Optimal length for Meta descriptions is roughly 155 Characters. Even if the importance of metadata has depreciated but it is extremely important in gaining user click-through from SERPs. Meta descriptions should be actionable and in an active voice, always write a unique meta description that includes a call-to-action and focus keyword. The purpose of Meta descriptions is to describe the contents of the page to the searcher. Your end goal is to convince and persuade the searcher to click through to your website. When writing a blog post, always link to your already published relevant blog posts. it helps readers to discover more useful content, and purpose is to make your blog post and your overall blog more engaging. Links To Internal Blog Post can help you to create more engagement and keep your readers longer on your blog. When writing and publishing content, be sure to keep an eye out for opportunities for internal links. This not only helps with SEO but also results in a better, more useful experience for the user – the cornerstone of increasing traffic to your website. This is one way of getting search engines to get to your older content a bit easier, thus increasing your WordPress SEO capabilities a lot. 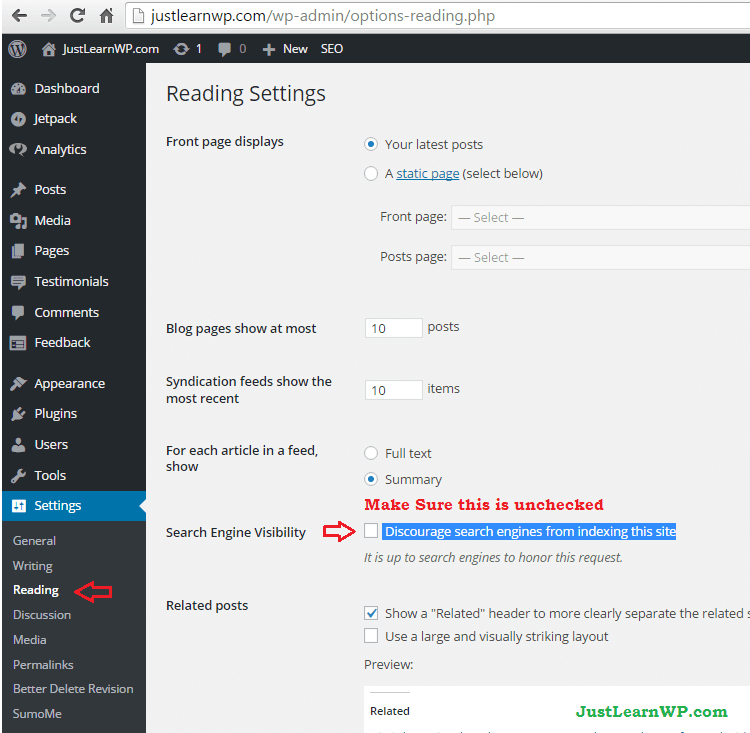 You can make this process simple by using WordPress related posts plugins. There are also a lot of WordPress related post plugins available that will automatically link certain keywords to certain posts. But Yoast SEO developers do not like this at all as they find it to look very spammy. JetPack has a Related Post model, if you want to select best-related content, you can use free plugins to select related post manually. Manual Related Posts by Julio Potier and Related by Marcel Pol are two WordPress related post plugins that let you select related posts manually. JetPack’s Related Posts feature scans all of your posts, analyze them, and lets you show contextual posts below each blog post your visitors might be interested in reading after they are done with whatever post they are on. JetPack creates Related content automatically based on the content of the post and any tags or categories if they exist. There are a lot of WordPress related post plugins that will automatically link certain keywords to certain posts. Here is a list some popular WordPress Related Post plugins. Read this article to learn more about 11 Free WordPress Related Posts Plugins. Image File Name: Always name your images properly. Give images descriptive file names. For example WordPress 4.4 Dashboard.png is much better than screenshot.png or shjsdh.png. With proper and descriptive image file names you help Google and other image search engines, you can get extra traffic from the different image search engines. Write Descriptive Alt text for images With proper and descriptive image file names you not only helps search engines but also help people with disabilities. Add at least one related image in your each blog post. It is recommended for better WordPress SEO. You can read more about Image SEO at Yoast Blog. Optimize your images for the web WordPress allows you to upload large images, but keep in mind that people browse websites from different devices. You don’t know who will be visiting your website. They might be using PC or maybe the smartphone. Not everyone has the access to fast Internet connection. Images can make your web pages load slower. Don’t add too many images in a single blog post. Always optimize your images for the web. There are many free and premium WordPress image optimization plugins are available. Install any free WordPress image optimization plugin. What if your blog has over 80% mobile users, what will you do? You will have to make your website mobile friendly and small optimized images can help you to make your blog load faster on mobile devices. I am not a big fan of WordPress image optimization plugins If you are going to add only two or three images in each blog post, simply use online service like https://compressor.io/compress or tinypng.com to compress your images. I prefer to use TinyPNG’s online service to compress images for each blog post manually. You can compress up to 20 images with maximum 5MB image size. They also have a WordPress Plugin to compress JPEG & PNG images, With a free account you can optimize roughly 100 images each month. If you are going to upload a lot of images then use an Image optimization plugin. WordPress image optimization plugins can save you a lot of time and your blog will load much faster. Social networking websites like FaceBook, Twitter and GooglePlus can increase blog traffic. Make it easy for people to share your content with WordPress social sharing plugins. Don’t forget to add an email subscription form to your blog. Email subscribers are loyal readers. There are many free WordPress social sharing plugin available. If you are using Jetpack, activate Jetpack’s social sharing module. Here is the list of some popular and up to date WordPress social sharing plugins. Sitemaps help search engines to crawl your website or blog better. Creating WordPress XML sitemap is really easy with free plugins. With XML Site-Maps you tell Google and the other search engines that your site has been updated. With such a sitemap, it is much easier for the crawlers to see the complete structure of your site and retrieve it more efficiently. Yoast WordPress SEO plugin contains an XML Sitemap module by default that you just have to enable it. Go to Settings > XML Sitemaps and click the checkbox and you have completed one more step to improve the SEO for WordPress. Sometimes after activating Yoast XML sitemap module, you will see some 404 or other error pages. To fix this issue go to setting > permalinks just click Save Permalink button. Yoast SEO plugin generates an XML sitemap for all your posts, pages, custom post types, tags and categories and (if applicable) other custom taxonomies. When you publish a new blog post or page, the XML sitemap is automatically submitted to Google and Bing allowing them to easily (and quickly) find your new content. Google XML Sitemaps is another free plugin to generate a special XML sitemap which will help search engines to better index your blog. Google XML Sitemaps is used by millions of WordPress users with 1+ million active installations Google XML Sitemap is one of the most popular WordPress plugins. We have also written a blog post for beginners to learn What is a Sitemap, How to Create One and 11 Free WordPress Sitemap Plugins. Google also recommends web developers to create XML sitemaps for websites. So don’t ignore XML sitemaps. By following recommended best practices you are increasing the chance to increase blog traffic. It is also recommended to add breadcrumbs and pagination to your blog. Which helps search engines to find links on your blog. Most premium themes allow you to enable numeric navigation and breadcrumb navigation. Otherwise, you can use WordPress plugins to generate Breadcrumb menus. WP-PageNavi by scribu: To add advanced paging navigation interface. In this WordPress video tutorial, You will learn how you can add the Breadcrumb Navigation Menu to your WordPress theme, I have used Twenty Sixteen Theme for this tutorial, but you can use any theme, You will have to add one line of code in your theme’s single.php file after activating Breadcrumb Trail Plugin. That’s all for this in-depth SEO for WordPress guide. By following these best practices you can improve your WordPress SEO. Now you know How To Make WordPress Site Seo Friendly. It’s time to start following best practices to optimize your blog for better SEO. SEO is a broad topic and you can not cover everything in a single article. I tried to cover SEO For WordPress in this article. Feel free to share this guide on Twitter, FaceBook, and other social media platforms. 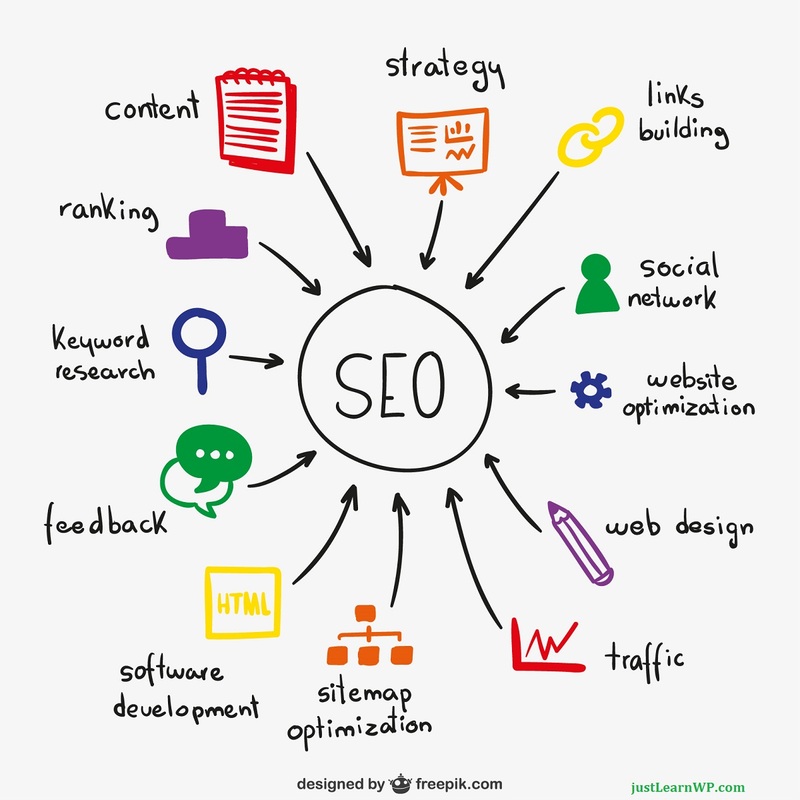 In this beginners guide to search engine optimization, I have tried to explain everything in simple Words to improve search engine optimization for WordPress website and blogs, but it is impossible to cover every topic in detail here. Here is a list of great resources to learn more about Search Engine Optimization. You will find a lot of great tips and techniques. WordPress SEO Guide by Yoast is a must read for all WordPress developers, designers and bloggers to learn basic and advanced SEO for WordPress. Yoast has explained everything in detail how to optimize your WordPress website for better SEO. Learn SEO: The Beginner’s Guide to SEO is a detailed guide from MOZ. If you are a beginner and want to know how Search Engines work and why SEO is important, how to get started with SEO, you should read this guide. Rand Fishkin has written this article 12 Rules for Choosing the Right Domain Name almost 8 years ago and updated this post on Oct. 4th, 2015. But this post is still relevant 8 years after the initial publication. Google has published a free course how to set up a great website and Choosing a Domain Name and Hosting Provider is a good read for beginners. Neil Patel of Quick Sprout has written a great post How Long Should Each Blog Post Be? A Data-Driven Answer. How to write great page titles and meta descriptions, guidelines by Google. Hello Tahir. Excellent resource. No doubt 2018 is around the corner and every SEO expertise are looking forward for some positive changes from Google. Cheers. Very comprehensive article. You mention that content is king and need to be optimized for both person reading and for bots. How does duplicate content affects rankings? Great article, somehow bloggers not take it seriously which cause so many problems. Thanks for this wonderful guide to make WP website SEO friendly. Great guide! I’d just like to add another plugin for image optimization – TinyPNG! I’m actually surprised you don’t have it here since I’m pretty sure it’s one of the most popular ones, but I could be wrong about that. Regardless it’s the one I’ve always used and it’s great. It only lets you compress 500 images per month (per site) unless you pay, but that’s always been more than enough for me. Thanks for your comment. I have been using TinyPNG online service for a while and I really love it. After installing plugin, You will have to create an account and with a free account you can optimize roughly 100 images each month. That’s why, I prefer compressing images manaully. Thanks for the article, you got it all covered! Reading this helped me understand why having an SEO-friendly WP site can be very useful and profitable as well. Really going through your blog helped to grow my idea more about the Seo for WordPress.It is true that creating a compelling content for your blog is very crucial and I think all the points that you have mentioned elaborately will be helpful to those who are beginners for Seo. The way you made the presentation is really catchy. Should I comment on content or presentation or article. Let’s start with content comment. Content was average. For reference part on conent you can search for websites like template toaster or hubspot or even crazzy egg have great content. The thing which was unique in this article was the presentation part. It hold me back on this page. The presentation part was outstanding. Even the top website blogs are not able to create such unique presentation on a blog. very good. I really like your post. I think post title is very important to entice readers to read your blog post and increase blog traffic. I have subscribed to your site and the guides and help provided are very useful. Interested creating my own personal website using WordPress for educational purposes. Downloaded WordPress from the net but having problems installing WordPress on my laptop with OS Windows 7. Please guide how to install WordPress on my Laptop? Please read how to install WordPress with WAMP server on Windows, You can also use Bitnami WordPress Installer to install WordPress on Windows PC. read How To Install WordPress On Windows 8 Using Bitnami Stack.